Lake Burton is a 76-acre impoundment located in Pittsylvania County, Virginia. This reservoir is owned by the Virginia Department of Game and Inland Fisheries and is managed primarily for fisheries related activities. The reservoir was impounded in 1950 and was stocked with various species of sportfish such as largemouth bass, bluegill, and channel catfish. Lake Burton is an impoundment of Tomahawk Creek and is relatively shallow and contains a number of fish species that were not originally stocked. These species either were in Tomahawk Creek prior to impoundment or were stocked by anglers. Lake Burton also contains a number of undesirable species such as common carp, suckers, bullhead catfish and gizzard shad. 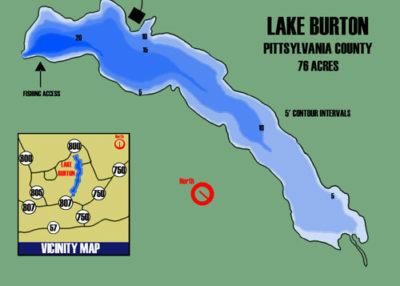 Small impoundments such as Lake Burton typically do not benefit from these species because they cause the sport fish populations to become unbalanced. Carp and suckers tend to keep water muddy while gizzard shad contribute to stunted sunfish populations. Turbid water and an abundance of undesirable fish species have resulted in an unbalanced fishery in Lake Burton. However, Lake Burton does have a very good largemouth bass fishery with a few bass in the 6-8 pound range but these fish may be challenging due to the large quantity of available forage. The large number of bluegill can provide fast action for sunfish anglers but these fish are small and an increase in size is not likely in the near future due to competition with gizzard shad. The crappie population fluctuates and is generally poor due to small sizes but this lake does generally contain high numbers including an occasional large crappie. Turbid water and an abundance of undesirable fish species have resulted in an unbalanced fishery. The only highlight to this fishery is the abundance of larger bass. A high percentage of the bass are 3-6 pounds but larger bass are available. However, the larger fish may be difficult to catch due to the large quantity of forage. In an attempt to resolve some of these problems that have persisted for many years, DGIF initiated a series of new management strategies such as carp removal, fish stockings and more restrictive regulations for largemouth bass. Largemouth bass reproduction and recruitment has historically been poor. The abundance of crappie, bluegill, carp, and suckers reduced reproductive success for largemouth bass. An experimental stocking of largemouth bass was conducted in 2004-2006 to improve the bass population and has improved the fishery. Largemouth bass growth rates at Lake Burton are outstanding from the abundant forage. The average size of adult bass (bass > 8″) has remained stable at approximately 15 inches with the largest fish typically at 8-9 pounds. These fish average 16.2 inches in length at age five. Largemouth bass are most abundant in the lower half of the lake where depths are generally more favorable. Bring a camera along in case you catch one of these trophy bass since it is illegal to harvest or retain bass in your livewell. Largemouth bass collected during Lake Burton electrofishing surveys. The top row is the inch group and the additional rows are the number of fish collected per hour of sampling for each size group. White and black crappie are both present Lake Burton. Crappie in this lake are abundant but are growing poorly. For good growth, crappie must convert to a primarily fish diet by the time they reach 6-7 inches. Since these fish are too abundant, their growth stops when they reach approximately seven inches for both black and white crappie. It is very common for crappie to be overabundant and stop growing at this size. When this happens they do not die from lack of food, they just stop growing. The crappie growth has moderately improved recently, providing better fishing opportunities, but there are still few crappie over 8 inches. Crappie (black and white) collected during Lake Burton electrofishing surveys. The top row is the inch group and the additional rows are the number of fish collected per hour of sampling for each size group. Sunfish are also very abundant. The overabundant bluegill population is a result of limited predation from largemouth bass and interaction with other species. Sunfish growth is poor and levels off at age 5 when they are 6 inches in length and is not expected to improve without considerable increases in the bass population. Even with increased bass predation, sunfish in this lake would likely continue to experience limited improvements due to forage competition with gizzard shad. There are very few redear sunfish (or shellcracker) available and most bluegill at Lake Burton do not exceed 6 inches. Bullhead catfish are the dominant catfish species at Lake Burton and average 11 inches in length. There are a few channel catfish in the lake but not adequate numbers for a good fishery with only an occasional fish caught. Statewide fishing regulations apply for all other fish species. Outboard motor use is prohibited. Electric motors are allowed. Prohibited activities: swimming, open air fires, trotlines, littering, sailboats, alcohol, and fishing tournaments involving prizes. Hours of use: Lake Burton is open to fishing 24 hours. Lake Burton has a good concrete boat ramp with limited parking. Located in a remote area, Lake Burton had not gotten much fishing pressure, but more anglers have been discovering this lake and pressure has increased. No restrooms or trash receptacles exist at the Lake. Bank fishing is allowed and there is a narrow strip of land that extends around the entire shoreline that can be utilized by bank anglers. The strip of DGIF property surrounding the lake is marked with metal T posts and yellow paint on trees. Anglers and wildlife watchers are permitted to walk around the entire lake if they stay between the marked boundary and the water’s edge. Lake Burton largemouth bass regulations changed to NO harvest of largemouth bass beginning February1, 2007. This regulation was designed to bolster the largemouth bass population and protect the few bass that attain trophy status. According to population estimates conducted in 2006, there was only 10 bass in the lake that were 21 inches or larger. Even with a few of these large fish harvested, the goal for managing this lake as a trophy bass fishery would be compromised. If you are one of the few anglers who are fortunate enough to catch a trophy largemouth bass, the following precautionary measures will decrease the likelihood of delayed mortality of released fish. Land the fish as soon as possible. Playing a fish to exhaustion diminishes its chance of survival, especially in warm water. Having the proper fishing tackle is important. Avoid excessive handling when landing a fish, removing the hook, taking pictures, measuring, etc. Always make sure that your hands are wet before handling fish. To handle trophy fish, wet your hands and then use your thumb to clamp down on the bottom lip and support the fish’s weight by placing the off-hand under the fish (toward the tail). Do not hold the fish in a horizontal position just by the lower lip. Water temperature’s of 75&deg;C and warmer are more stressful on fish. Fish should not be out of the water for more than 60 seconds. Proper handling and care of trophy largemouth bass will increase everyone’s chances of catching a trophy bass.